British (English) composer and conductor. AL. 1p. 18 Orchard Square, Portman Square, W. 13th March 1877. To Mrs [Thomas] Shapter. 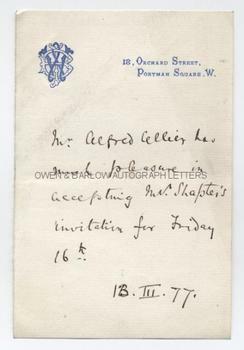 "Mr Alfred Cellier has much pleasure in accepting Mrs Shapter's invitation for Friday 16th." 12mo. Approx 6 x 4 inches. Lacking integral blank leaf, else fine. Alfred Cellier composed many pieces, including the comic opera 'Dorothy' that became the 19th century's longest running production for musical theatre. It is, perhaps, as the musical director of the D'Oyly Carte Company and for his conducting, directing and the writing of overtures for the original productions of Gilbert and Sullivan's operettas that he has been most remembered. From a 19th century album compiled by a daughter of the Exeter surgeon and epidemiologist, Dr Thomas Shapter.